In our society today, there are so many social issues that cause our nation to be so divided. 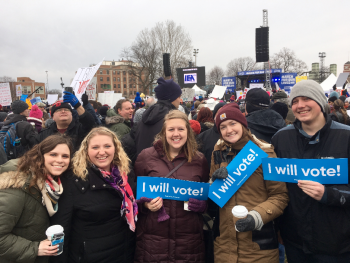 When I decided to enter the social work program at Spring Arbor University, I knew I was in a field where I could speak up and make others notice the injustice occurring in our nation. During my semester in Chicago, I have been able to continue to raise my voice to issues that are causing harm to so many. One of ways myself and other Chicago Semester students have made our mark is by attending the March For Our Lives – Chicago Rally. Not only was this event bringing together people from all different backgrounds and neighborhoods throughout Chicago, but it provided school-age students with the platform to organize an event to raise awareness about the violence that is occurring in their schools and communities. Being able to observe and show my support for an issue that is more than just about gun laws, but about creating a society based on love and support and not violence. Social advocacy does not always have to be on such a large scale, but in ways that promote the basic human rights of all. Working with Heartland Alliance Refugee and Immigrant Community Services, I have been able to see some of the small ways I can make a difference and provide a voice for the voiceless, not just in my community or nation but around the world. Being aware of the issues and making sure that others know about the issues is where it all begins. Even if you are not in the helping profession, you too can make a different through the way you live your life and how you serve God’s people. As Christians, we are called to bring awareness to the struggles of this world. We are not called to sit back and ignore what is happening around us. We are not called to a life of comfort, but to a life of struggle and discomfort. Living and working in Chicago has prepared me for this roller coaster of a life. You learn so much about yourself and the world around you when you are pushed outside of your bubble and into an area where you can learn and grow.